Genoa is genuinely crippled by this disaster. The city is literally divided in 2. So many areas are closed and so many families have been evacuated and so many businesses affected. Even giants like IKEA are feeling the pinch in just 20 days from the collapse of the bridge. You can only imagine the damage to smaller businesses. Some big companies had to layoff or rather suspend some personnel indefinitely as well some parts of their building is right underneath the bridge so it is not safe for them to work. Now the city is also at almost a standstill especially during peak hours as traffic that usually passes by the city via the highway has now got to go through the city and back onto the highway. Good thing is that highway is free for now. Even the Telco companies are waiving this month’s bill in solidarity to businesses within the vicinity of the bridge. Our business is one of them. Some places are so dead…it is disconcerting and sad. I hope we bounce back soon. I hope that the displaced families will have everything sorted before winter comes. So, late last year some time in end of November, a friend came to visit as he was based in Europe for a few months and wants to make the most of his tenure here in Europe. I became his tour guide. It was short days but he was not adverse to walking so we walked the historic centre. Took him on a bit of a mini gastronomic adventure. The to die for fresh whipped cream cones and with coffee, the chickpea delicacy known as farinata, and fried seafood at a historical hole in the wall place. Didn’t take him to eat the best (according to me) foccacia in town but I think we got him some foccacia formaggio which is a Ligurian speciality. More specifically a Recco speciality. Anyway, enough about food. While we were walking around town, I took him up another way, past a bridge that I myself have never walked before. Past it but never crossed it. I could have in my early days here but not since then as I don’t remember it at all! As we crossed the bridge I saw this in front of me. 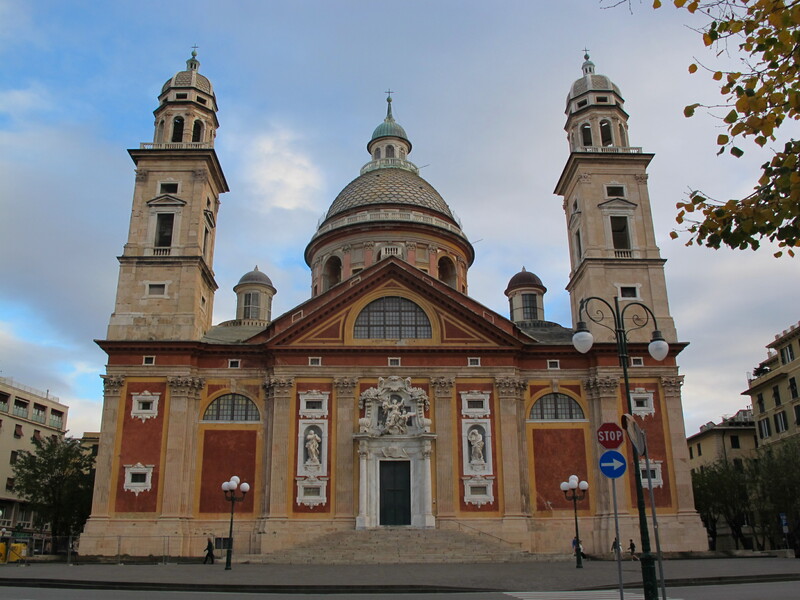 Besides the St. Lawrence Church in the historic centre, this is another important church. Please excuse the shaky video and not so good commentary. I heard from the cousin as she was leaving the office that it is sowing heavily and that she is leaving now to get home. I jumped up, got my camera and started filming. Didn’t know what I was going to do about it. I just thought that this might be a good post. See, how hardworking…. >_< Can’t blame the cousin for getting off early. She lives a little further away and to get to her place, the roads are curvier and a lot more steep and narrower than mine. Those who have been to my place will know, that is quite bad. At any one time, only a car can be going either up or down. The other has to find a hole to squeeze in and let the other pass. Worst when there is a bus. M just went to get the quad bike for tonight. Guess what is our mode of transport today? The little big kid is having fun whenever it snows. 😀 Can’t use our vespas as they are a tad unstable in all this snow and steep curvy roads. Especially with slush and ice. On flat roads, it is fine if we go slow but here in Genoa…..well, dangerous. Where my inlaws stay it is worse. Snow is fine but when it melts and becomes ice there is no way you can get home. My BIL innovative way of getting home is a cardboard box sliding down the road and then on all fours crawl his way back a few metres up to the door. Welcome to Genoa! So far I am enjoying the snow from the comfort of my office, in front of my desk at work. Ok, technically not working now as I am sneaking in a blog post. This is how I am braving the snow. Now back to work. Was going to post about CNY but maybe the next post. In 1815, the Congress of Vienna gave the most Serene Republic of Genoa to the King of Sardinia, Carlo Felice. In 1827, this King built a New Gate of the “Lanterna” in the place of the 17th century gate which was a few hundred metres further east. You can see the Sabaude Coat of Arms which crowns the gate. Originally this gate was situated at 90˙ angle with respect to these walls, it has been leaned against them to conserve it and to still be seen by visitors. This area, made into a park, was originally the road to Genoa from the west. Christopher Columbus or Cristoforo Colombo on the wall of his native city’s city hall. Genoa’s prodigal son, watching over the city’s weddings. 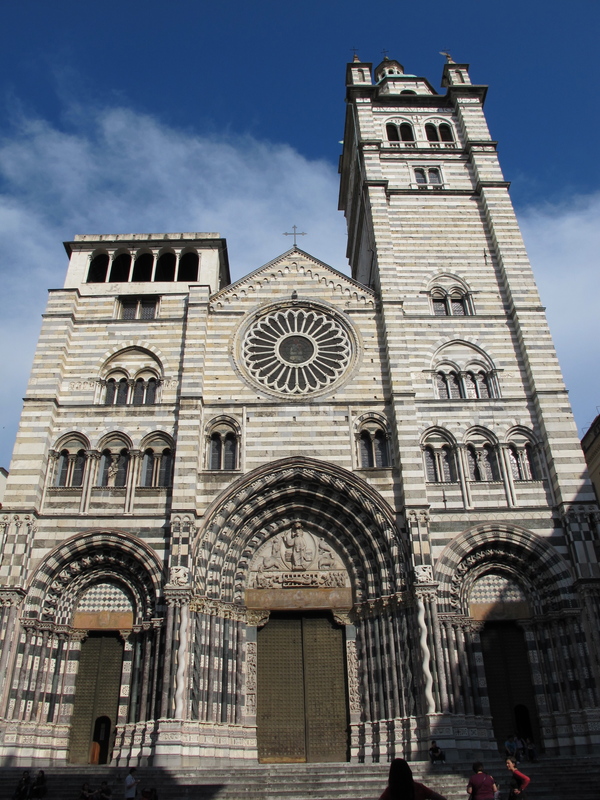 The St. Lawrence Cathedral is one of the most important churches in Genoa. I have a better photo somewhere but I think this is pretty good, if I can say so myself. Sampdoria is back in Seria A! Blogpost coming up soon! 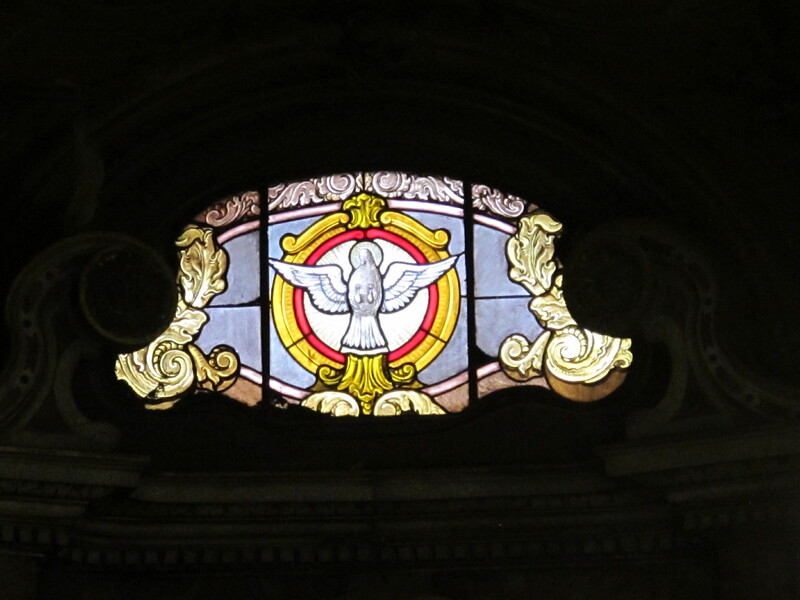 Emblem of Genoa. 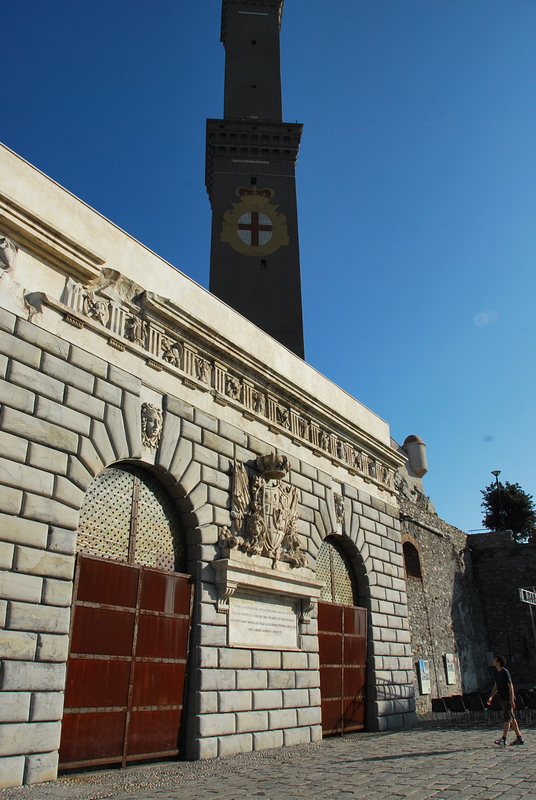 Genova also known locally as Zena and in Genoese dialect Zuena. I have decided to add another dimension to my blog. Besides just blogging, I want to post photos as I go about my days not just to my Twitter account which many of you are not my followers and to be able to post just photos without the need of a full length post about them. Just photos and let them speak for themselves.